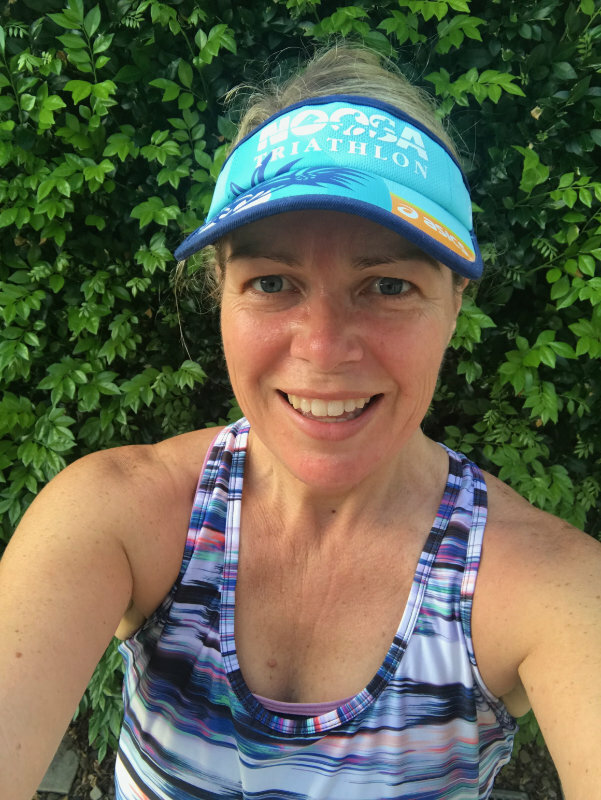 Why Would Anyone Do an Ironman Triathlon? Why would anyone want to do an Ironman triathlon? I get asked that a lot. As well as what is an Ironman triathlon? It’s easier to answer the second question first. An Ironman triathlon is a 3.8km swim, a 180km bike and a 42.2km run. And that’s all in one day. One after the other. So, why would anyone want to do an Ironman triathlon? Who knows! For me, it’s the Challenge. It’s pushing my body to do something that most people couldn’t, or wouldn’t do. It’s something I’ve wanted to do for a number of years. 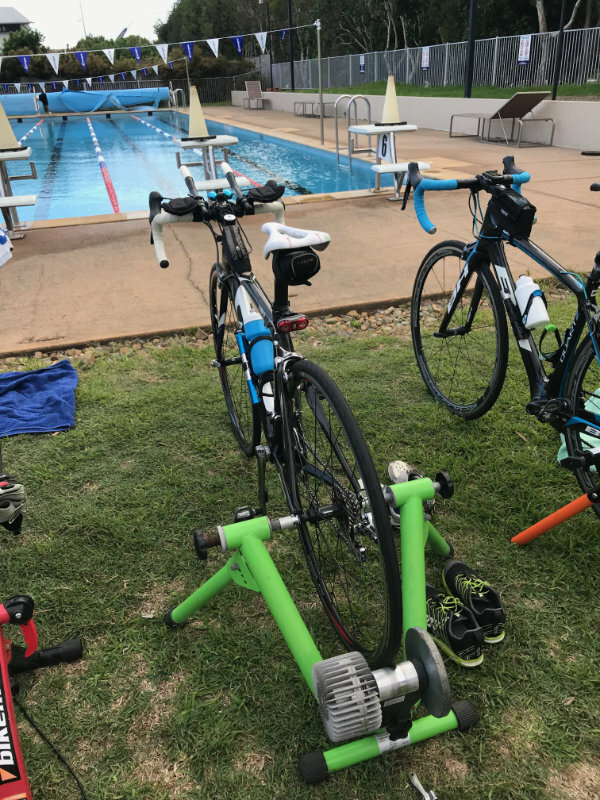 I bought my bike 5 years ago to do triathlon, and I gave up playing football to concentrate on triathlon. 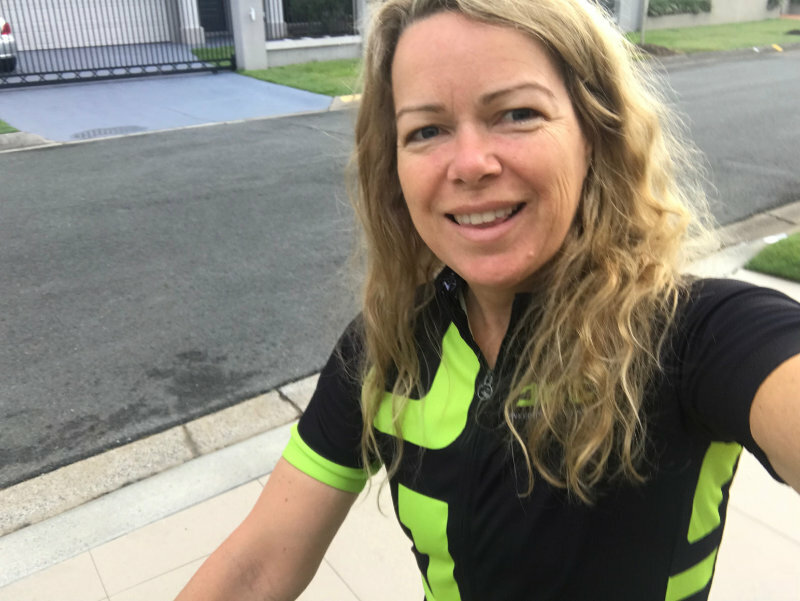 I initially gave myself until I turn 50 to do it, then thought that was too far away and made it 45, then time ticked away, I turned 45 and hadn’t done it and I realised it’s not something that you can say you’ll do, and then do it a month later. This needed time and planning. So last year I decided that 2018 will be the year. 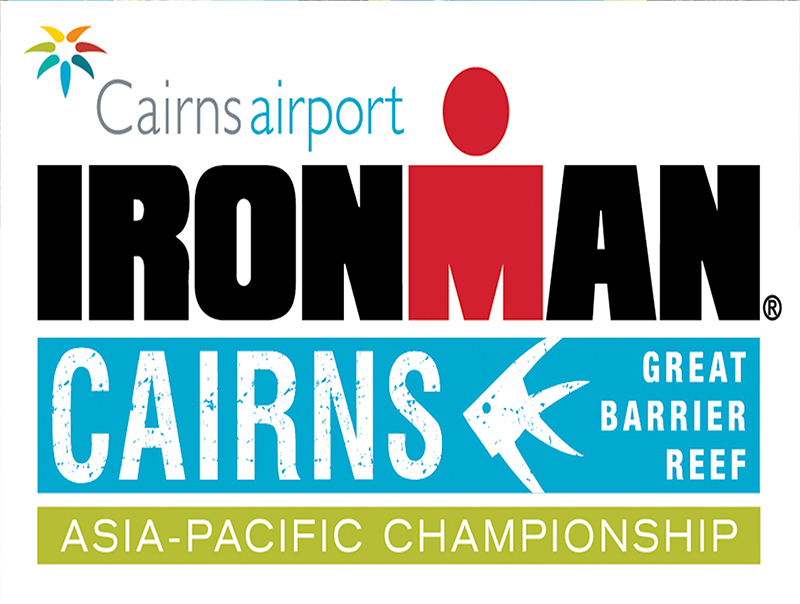 And Cairns will be the event. Like I said, it’s not something that can be done quickly. I’ve got a long campaign ahead. A campaign that started on 23rd October, 2017 and will finish at the World Championships in Denmark in July 2018. How do you even train for something like this? I don’t really know. But I know someone who does know. So I asked him – Des Gooda – he does all the thinking and planning for me and all I have to do is the actual session. I mean sessions. At the moment that’s 10 per week. Yep, some days I double up! I’ve just finished my first four week block. The first four weeks have just been about getting me use to the structure of the training. The sessions range from around 30 minutes to around 3 hours. There’s only one long 3 hour session and there’s a rest day and 2 rest afternoons! I was talking to Des a few months ago when I set the event to Cairns and he suggested that I just enjoy this year in the lead up to the training, as long as I didn’t sit on the lounge for 3 months. 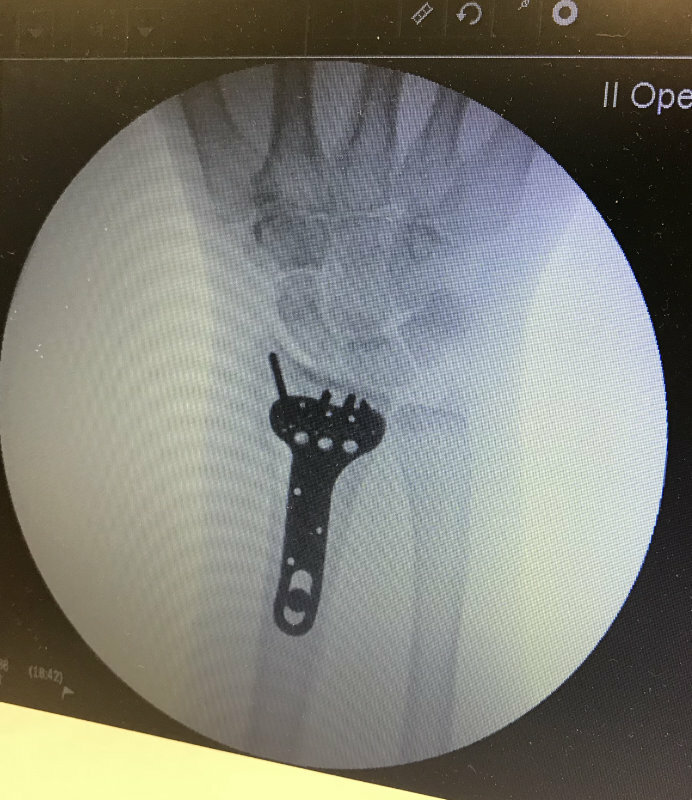 Well, as it turns out, I went snowboarding and broke my wrist, which then required surgery for a plate and 7 screws to be put in. And 10 weeks later started my training. So while I didn’t literally sit on the lounge for 3 months, I was a lot more inactive for the 10 weeks prior to training than I would’ve liked. 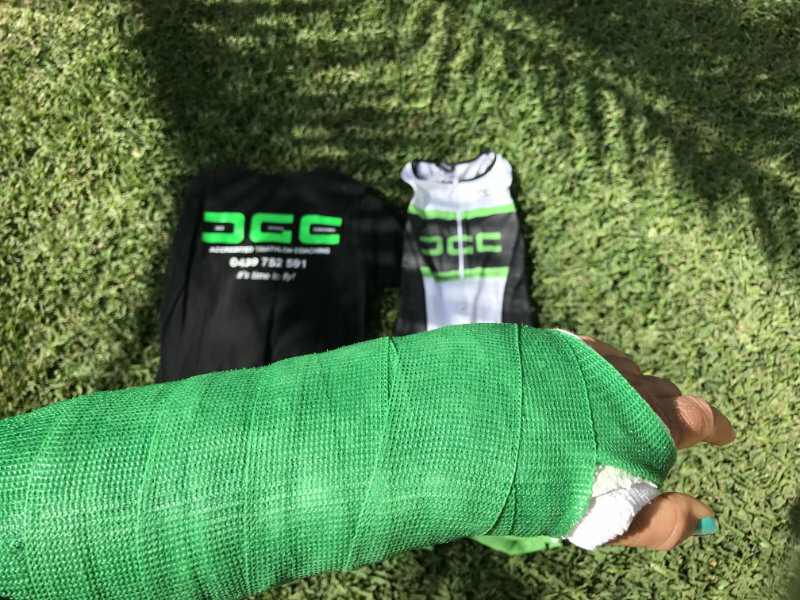 I had a green cast to represent the green of DGC Coaching and the Green and Gold of Australia – to keep me motivated when I couldn’t train. 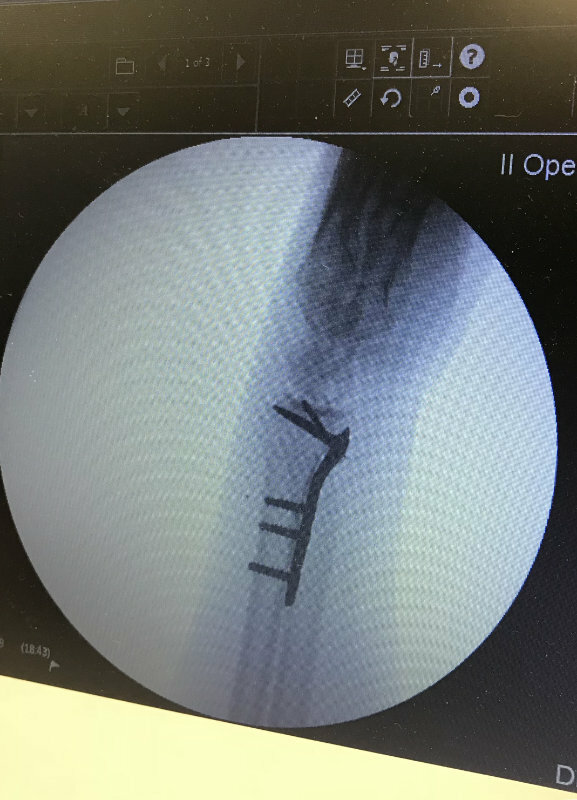 It looks like a bug crawling in my arm! The plate is about 9cm long. And I definitely noticed that lack of fitness when I started regular training again. The short runs that were once easy, were now hard. My legs felt heavy, my breath was more laboured, my recovery took longer, but over the past 4 weeks I have seen improvements. And that’s the thing that is a big positive. Whilst I have a lot of improving to do, prior training means I’m likely to see the improvement pretty quickly. 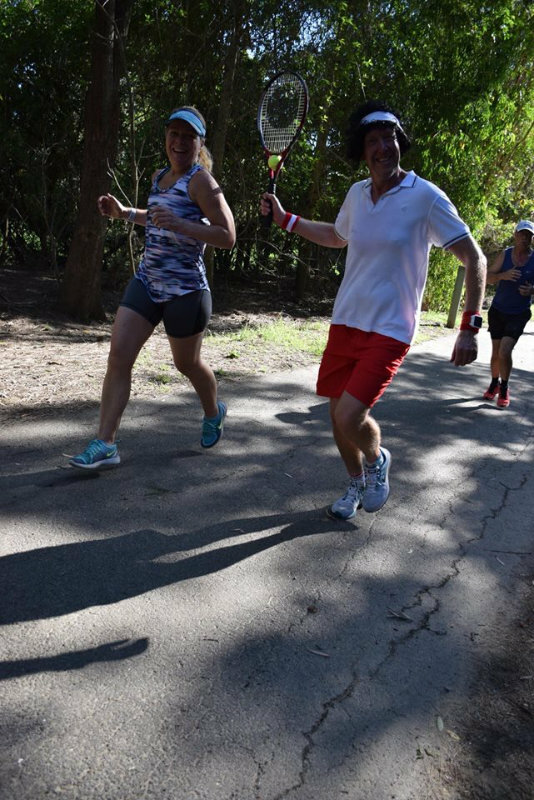 One of my first runs back – park run Mudgeeraba with Steve. 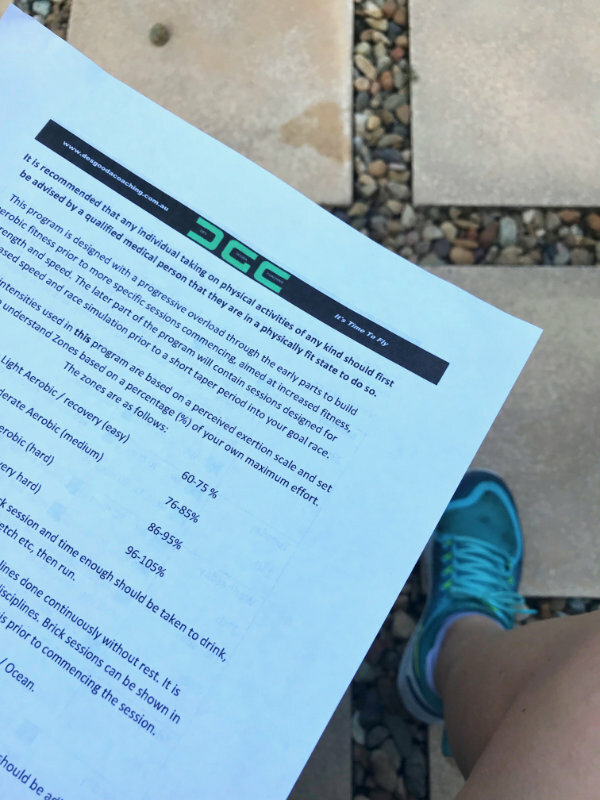 During this first 4 week block Des and I looked at other events and how they fit into my goals. My main goal has always been to finish an Ironman. And that’s Cairns in June, 2018. Then a seed was planted by Des about the long course World Championships in Denmark in July. I have had a goal of representing Australia and wearing a green and gold Australian triathlon suit for a few years. But I thought achieving that goal was many years away. 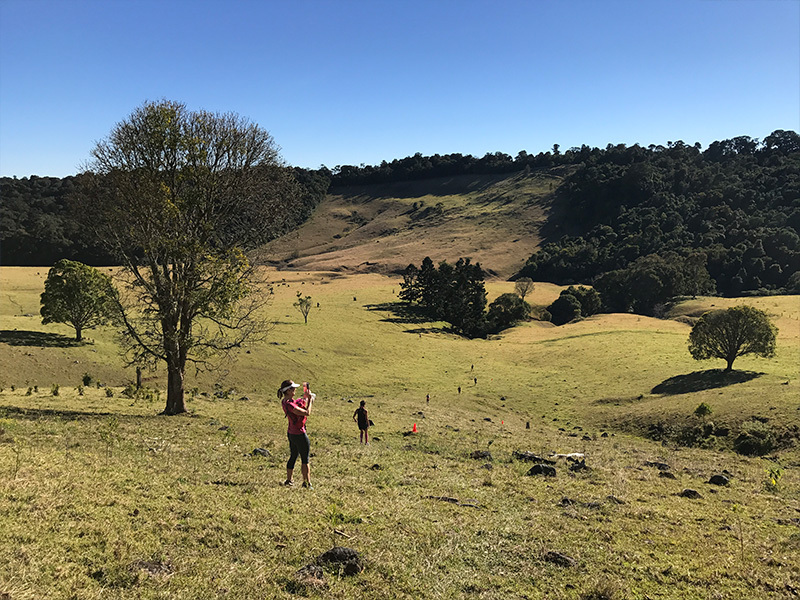 When Des suggested the long course World champs it was because a local race, the Tweed Enduro, had been named as a qualifier. And that race fitted into my plan. At least I get to ride to beautiful places. Then we looked into it a little more. 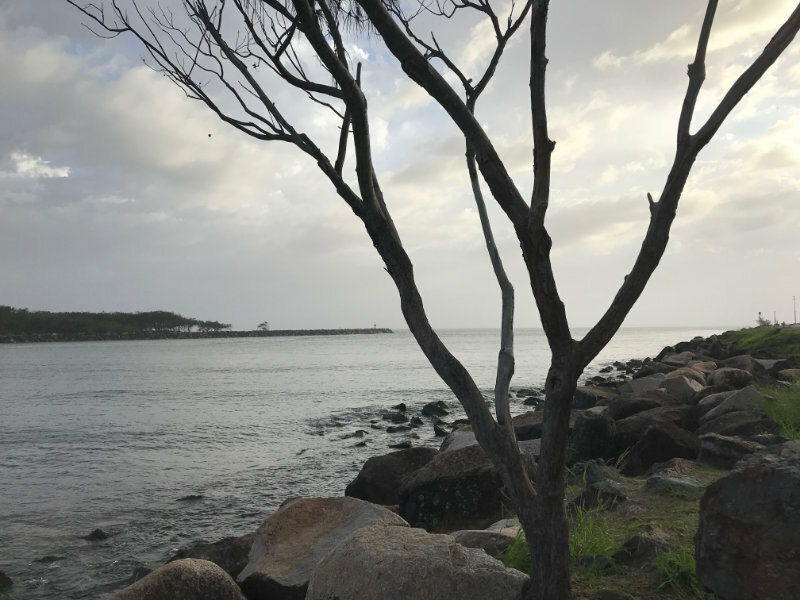 I had entered Port Macquarie 70.3 in May, 2018, but that’s not a qualifying race. However, Challenge Melbourne is and it’s 2 weeks before Port 70.3. So the plan is to enter Challenge Melbourne, and have 2 qualifying races under my belt. Hopefully that will give me enough points to make the Australian team. As I write this I have finished my first four week block of training and am starting my next block tomorrow. This first four weeks has been about getting back into routine. The hardest part has not been the 10 sessions each week, it’s been the running in the afternoon. For years I’ve been a morning runner. And now having all day to think about the run is a new experience. Also getting my food intake right. Making sure I eat so I have the energy for the session, but not eat too much and feel sick when running. It’s obviously also hotter in the afternoon, but that’s something I have to prepare for with the Tweed Enduro in February. The end of another hot run. If you’re interested in following my progress you can follow me on Strava, Facebook, Instagram or sign up to the newsletter for regular updates from Sweets and Greens which feature training, recipes and some giveaways. 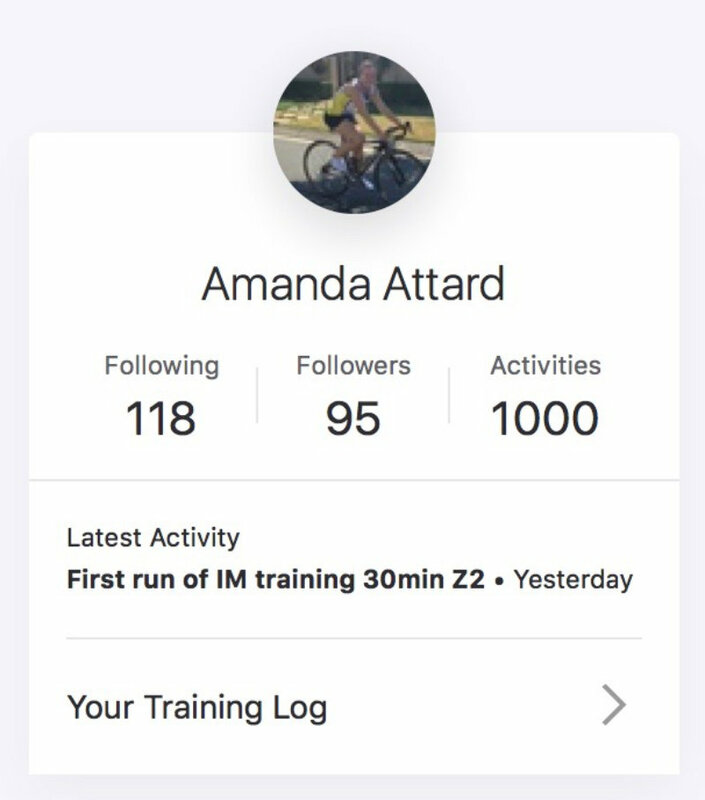 My 1000th Strava activity was my first session in my Ironman campaign. 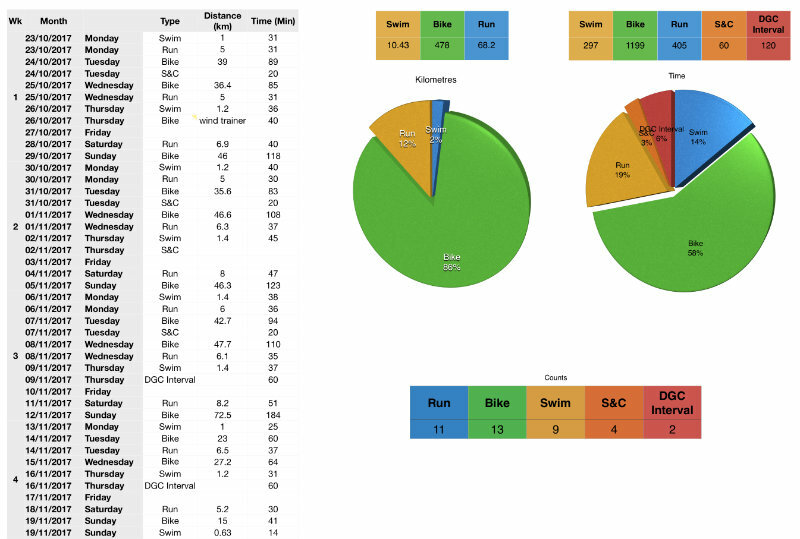 And because I love spreadsheets, here’s an overview of my first four weeks in kilometres and minutes! Because you can never have too much data. Obviously something like this can’t be done without self-motivation, which I have. But I’d love a little extra motivation. So please write a comment below for those times when I need a little something extra! Yay! Thanks April! I actually have a bracelet that says those exact words and often wear it when I’m training.